Holos! Holos are polishes in hindsight I wish I appreciated more in my earlier nail polish days. I got into the nail polish just as these were getting sold out on e-tailers. I got a few things, but I should of got all was that available at the time. Today's bottle spam, is of the holo variety! These are scattered holos and linear holos. I almost included polishes with holo glitter, but we'd be here all day. That will be another Saturday! 1. What is your favorite holographic polish that you own? 2. 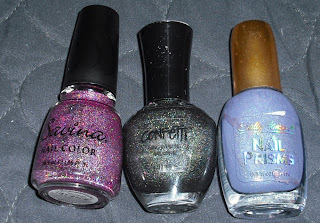 What holographic polish are lemming (wanting) most? 3. What is your favorite color holographic polish or what color holographic polish would you like to see? 3. I'd like to see a wine colored holo or a navy holo. P.S. Tomorrow is "Share With You Sunday" if you have any blog posts you'd like to share please fill out the form. OMG your holo collection has me so jealous! 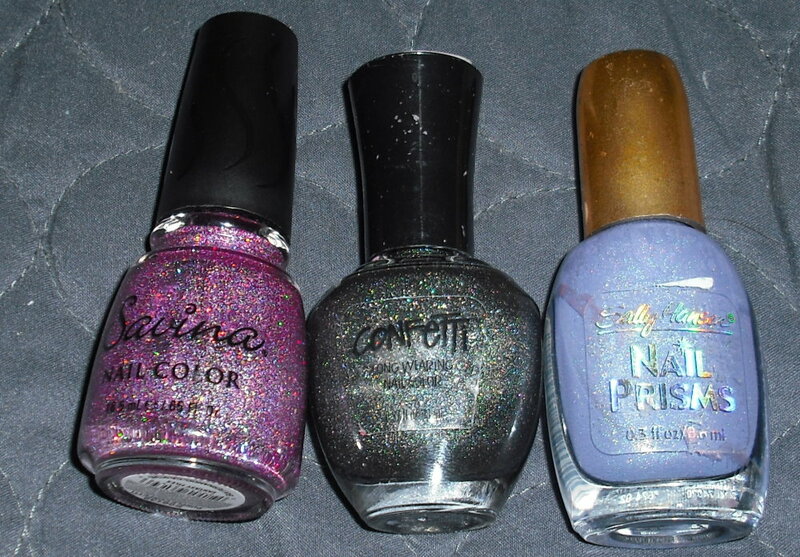 I don't own many holos but my truest and most favorite Holo has to be CG OMG. I am seriously lemming the Pink Nfu. OH (can't remember the number) of CG's BFF. I'd love to see Nfu. Oh #61. I cannot get enough swatches of this color. 2. Nfu Oh 61 and Gosh Holographic! 1. My favorite that I own is Nfu Oh's 61. 2. I reeeeally want the pinks/purples from the OMG collection. I also want Hyper Haute from the Tronica collection. 3. I'd also like to see a nice navy holo. 1. Tie between DV8 and LOL! 3. I'd love to see a strong grayed-purple holo. 1. Oh it's hard to decide...but I think DS Original! I Looooooooove holos. Right now, I think my favorite, right now, is DV8, although that is subject to change at any time. I am also seriously lemming OPI My Private Jet. I also can't find a Color Club Revvvolution that isn't a dud. I would like to see a navy or dark emerald holo. Or a re-release of a nice black holo. Love love love love holo polishes! 3. I'd love to see a hunter green and a teal holo! A dark red holo would be great too! Oh wowwwwwww. I want your entire holo collection. Wow, I'm so jealous, lol! Especially love the CHG ones, they just stood out for me. 3. Deeper holos, a real proper jewel tone holo collection would be amazing.